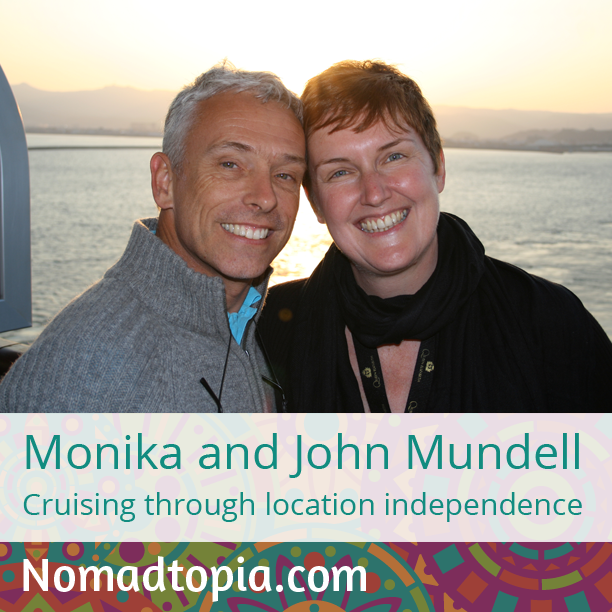 Monika and John have had their share of adventures over the years, but eventually ended up feeling a little stuck living abroad in Australia. They decided to revamp their lives and have been on the road, traveling mostly by cruise ship, since March 2014. Living in gratitude pretty much 24/7. We’re grateful for having had the courage to follow our dream, and not be discouraged by challenges and hurdles. It has made us even more determined to live outside of the box, and to encourage others to do so too. We’re collecting so many amazing memories every single day and are meeting the most incredible people everywhere we travel. We’ve experienced no huge surprises. We’ve travelled a lot for the past 30 years, so we’re comfortable with that aspect of our lifestyle. But the one thing we both notice is the kindness of strangers and people around the world. Being location independent really does reaffirm that the world (+ its people) is a beautiful place.